Have a question on Korando? Korando is available in 7 different colors - Grand White, Silent Silver, Sable Grey, Space Black, Tonic Grey, Vitamin Red and Ice Blue. Watch latest video reviews of Ssangyong Korando to know about its interiors, exteriors, performance, mileage and more. SsangYong is a South Korean auto brand which is known for its striking features and powerful engines. This SUV was firstly introduced way back in the year 1983 and its third generation was launched in the year 2010. It has been more than 30 years after its first launch and half of a decade since its last generation and their is no sign of its charm fading through. Well, the reason behind this success is nothing but its regular facelifts and advanced technology which kept it competitive in an auto world filled with giants where new technology and comfort features are introduced on a regular basis to attract customers. Slide inside the classy cabin of SsangYong Korando and you would never feel like coming out of it. Deluxe fabric/leather upholstery has been furnished on the seats of this crossover for a premium look. Front and rear all seats have heating facility so that you get more comfort during those cold days. The dual-tone dashboard with logically employed instrument panel and controls give you the liberty to control this vehicle and track all the readings with much convenience. Well, comfort and class are not the only features which are showed off in this drive, you also get a decent entertainment system which makes your drives more enjoyable. MP3, RDS radio, Bluetooth, USB, AUX , CD player along with 6 speakers are provided in Korando for the entertainment of its passengers. The audio controls can also be controlled with the remote provided therein. A trunk worth 486-litres make sure that it accommodates all your luggage without any compromise. 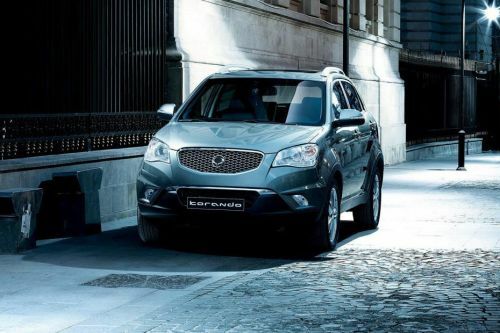 The newly designed SsangYong Korando has an elegant exterior which is quite distinguished with its previous appearance. This new look has got a generic revamp with a better front grille and stylish headlamps. Its dark side pillars and bold wheel arches add to its sporty appeal. Its sweeping roofline has roofrails and electric one touch sunroof which add more value to its aesthetics. Overall what you get in the name of SsangYong Korando is an urbane crossover with an elegant structure and sporty features. This sporty drive comes with decent dimensions counting to 4410 mm x 1830 mm x 1675 mm (L x W x H) along with wheelbase measuring at 2650 mm which is good enough for a 5-seater. The Korando S is packed with 17-inch alloy wheels along with 225/60 R17 tires and the top notch trim, Korando DLX, is complemented with 18-inch alloy wheels and 225/55 R18 tires. SsangYong Korando is available in 2 trims in UAE – Korando S and Korando DLX. The S trim is available in 2WD and AWD, both, and the DLX trim come packing with AWD only. Both of these variants have 2.0-litre petrol and diesel engines with 6-speed manual and automatic transmissions packed under their hoods. The diesel engine churns out a maximum power output counting 175 PS at 4000 rpm along with a maximum torque measuring 360 Nm between 2000 and 3000 rpm. The petrol engine of this drive is less efficient in comparison with the diesel engine and knocks out a peak power clocking 149 PS at 6000 rpm and peak torque counting 197 Nm at 4000 rpm. This petrol engine races from standstill and reaches to 100 kmph in 9.8 seconds with a top speed of 163 kmph which is quite decent for a crossover. Also, a mileage of 7.5-litre/100 kms is delivered by this engine making it prove economical on combined driveways. Luxury is not the only things which is loaded in this SsangYong drive. You get dual airbags along with 5 seat belts so that the passengers may get protection during a hit. With all this, you get Active Rollover Protection, Electronic Stability Programme, Anti-Lock Braking System and Electronic Brakeforce Distribution for a stable and controlled drive on slippery terrains. The front seats of this drive have active head restraints for protection against any head and neck injuries. Hill Start Assist is also featured in this crossover to assist the driver in up hilling the pick-up with much convenience. For comfortable ride and efficient handling, this Korando is packed with McPherson Strut suspension on front wheels and Multi-Link suspension on rear wheels. SsangYong Korando is a 5-seater SUV with robust structure and appealing features at interior. Its diesel and petrol, both of the engines, deliver appropriate power and efficiency to make this a perfect vehicle. What is the price of Ssangyong Korando? On road prices of Ssangyong Korando in starts from AED73,500 for base variant 2.0L S (2WD), while the top spec variant 2.0L DLX (AWD) costs at AED93,500 . What are the colors options available in Ssangyong Korando?